Rhodes Town offers you two towns for the price of one! The modern island capital has broad tree-lined avenues, excellent shopping, imposing public buildings, smart restaurants and nightclubs, whilst right next door, the magnificent old town is a stunningly well-preserved Crusader fortress city, built by the Knights of St John. Wandering around the cobbled streets it’s easy to picture how it must have looked back in the Middle Ages – despite the modern boutiques, tavernas and souvenir shops! 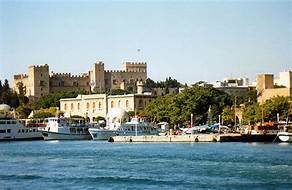 The picturesque harbour, once the site of the 100-foot-tall Colossus of Rhodes, one of the Seven Wonders of the Ancient World, is now full of luxury yachts from all over the world. 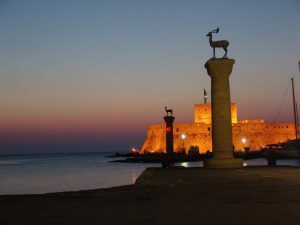 Rhodes Town is the perfect base for exploring the whole island by local bus, coach excursions, boat trips or hire car – you can even hop across to nearby Kos, Symi or even Turkey, for a day trip! The new town has excellent shopping facilities whereas the old town has a wide range of restaurants and tourist shops. Near the village of Kalamonas is a unique natural habitat where you can see thousands of brightly coloured butterflies. This shady valley with a stream running through the trees attracts butterflies in the hot months from June to September. Follow the winding paths through the pine trees, enjoying their fragrant resin and cooling canopy. 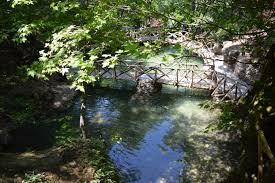 The butterflies will enchant you, as will your surroundings, with wooden bridges, stone steps and a waterfall. You can easily spend a day at the valley and there is a restaurant and picnic site if you get hungry. An uphill path leads to the Monastery of the Virgin of Kalopetra where you can get refreshments and snacks prepared by ladies if the village. 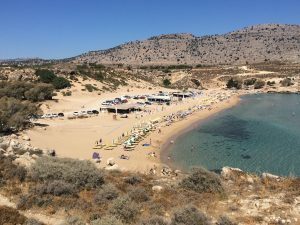 At the southern tip of Rhodes, Prassonissi is a smalll island about 20 m away. You can walk across as the waters are never deeper than 1.2 meters (4 feet). The shallow waters form a lagoon that is ideal for children and for just splashing about all day long. The waters of the Mediteranean and the Aegean meet here creating a windsurfers and paragliders paradise. 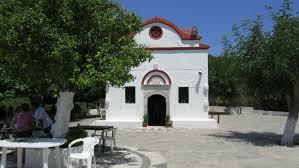 In late December 1928 the Government of the Islands of the Aegean decided to construct the building complex. The project was commissioned to the famous architect Pietro Lombardi. 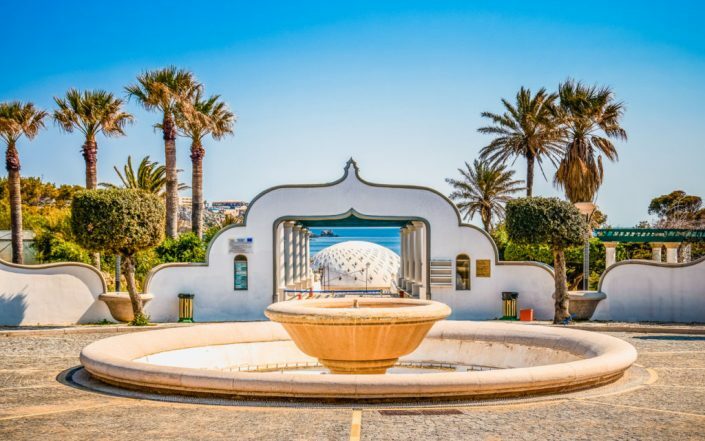 His plans for Kalithea Thermal Spa were considered among the best architectural compositions of the time, masterfully combining different architectural styles from Arabic to Baroque including Art Deco. It was considered, world-wide, as one of the most emblematic architectural constructions of the 1930s. 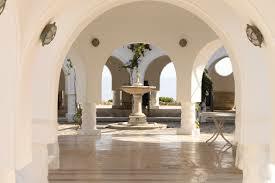 Today Kalithea Springs is one of the most distinctive landmarks of Rhodes. 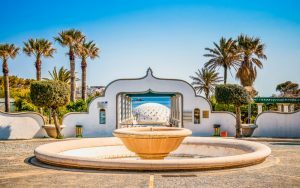 Although the spa is no longer in operation, this fabulous buildings and unique architectural monument, surrounded by palms and pine trees, have been recently restored, converted to dining and cafe facilities together with sun beds in the lagoon. The exotic vegetation combined with emerald waters of Kalithea’s cove match perfectly with this idyllic scenery of the surroundings and create a fabulous picturesque beauty reflecting the films that were shot here. This beautifully small sandy beach is only ten minutes away, just off the road to Haraki. The waters shelve gently making it very safe for bathing. Facilities include sunbeds, taverns and water sports. 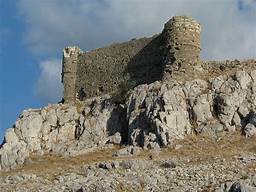 Close by are the ruins of the ancient 14th century castle of Feraklos which stands on the site of an ancient Acropolis. The castle was used by pirates before the Knights of St. John ousted them, reinforced the site and used it as a prison. Reached from the track by a footpath leading to steps, it is a good climb and fairly rough underfoot, it is t about 300m above the sea level.